One of the great American art pottery producers along with McCoy, Hull, Shawnee, and Roseville was Red Wing Pottery. The company had its origins in the 1860's in the rich clay found in Red Wing, Minnesota. The Red Wing name was debuted in 1877, and the company continued under various names producing crockery, art pottery and dinnerware until 1967. In 1967, the company closed it doors mostly due to the ever increasing competition with Japan. 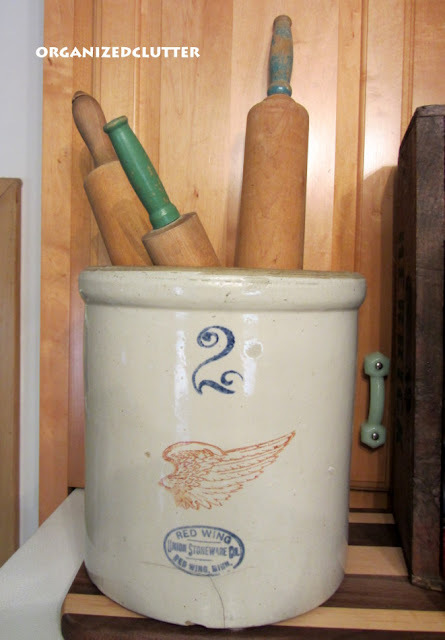 This two gallon crock with old rolling pins was my Grandma's crock. It sits on top of my refrigerator. Many of you that follow my blog will maybe remember my 20 gallon Red Wing Crock that I use as a table between my adirondack chairs on the covered patio. I purchased this crock but can't remember what I paid for it. Not very much, maybe $25. 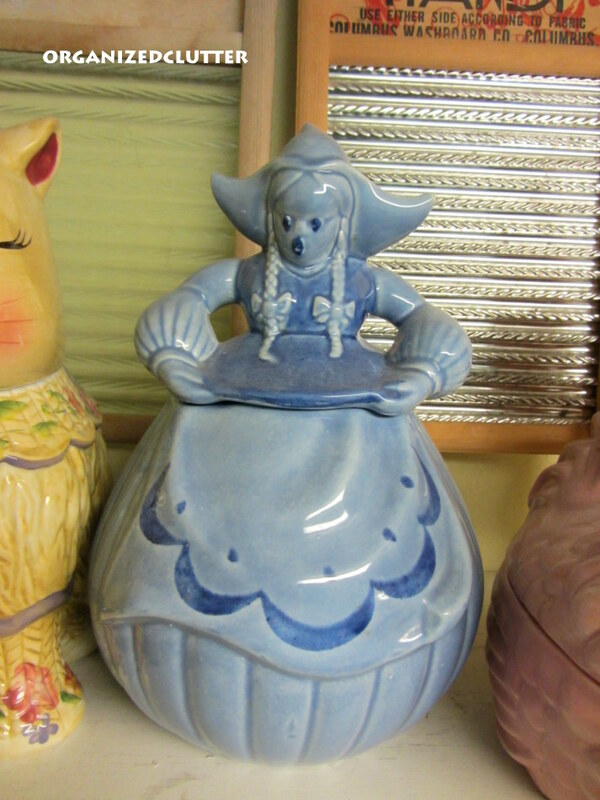 Katrina, the Red Wing blue Dutch girl cookie jar was also my Grandma's. She sits atop the cabinets in my laundry room. Katrina debuted in the 1940's and continued in production until the mid 1950's. 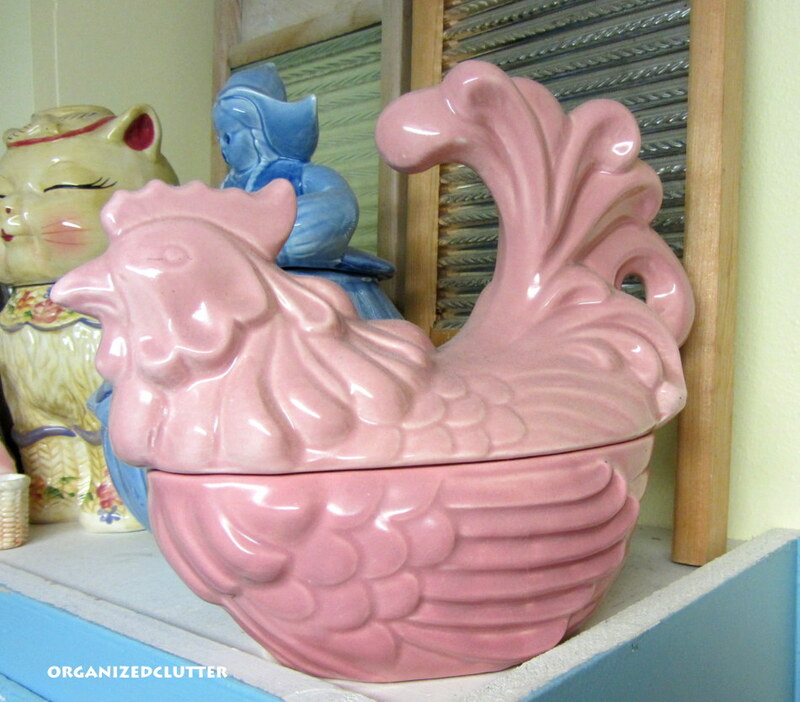 Also on top of my laundry room cabinets is this Red Wing rooster cookie jar or casserole. (I have seen it referred to as both). The rooster was also my Grandma's. I may have more pieces of Red Wing pottery but it's packed away. These are my favorite pieces, and they are all on display in my home. 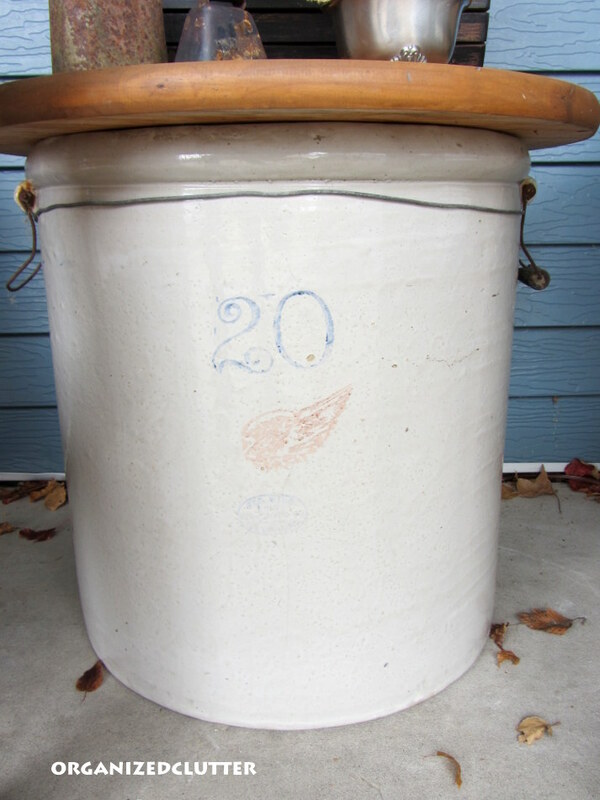 Do you collect vintage Red Wing Pottery? Beautiful pieces, I have one piece of Red Wing. I found a beautiful old base at an estate sales some years ago. I'm not sure. I have a cookie jar in question. I have it stored away right now. It was my mom's. Great crocks and I love the dutch girl cookie jar. I enjoyed all your cookie jar pics. Thanks for the comment - I love your crock as well! I've been keeping my eye out for one of these at a reasonable price - looks like you found it! Haha. I don't have any Red WIng. I would love to have room for a collection of cookie jars like yours. Thanks for stopping by. There isn't a tag on mine. I thought it was handmade. They had two sizes when I bought it at a fair. Either the person took the tag off or copied the idea. So funny. I knew you would like Sue's......she has the best imagination. Lovely pieces! I had always heard of Red Wing, but didn't know what it was. Hi Carlene....hope your day is going well. I do have some pieces...a mixture really of different makers...but they are among my favorite items in our home. Beautiful vintage pieces. You are so lucky to have them. I live in Minnesota and don't own a single piece. Yikes!!! 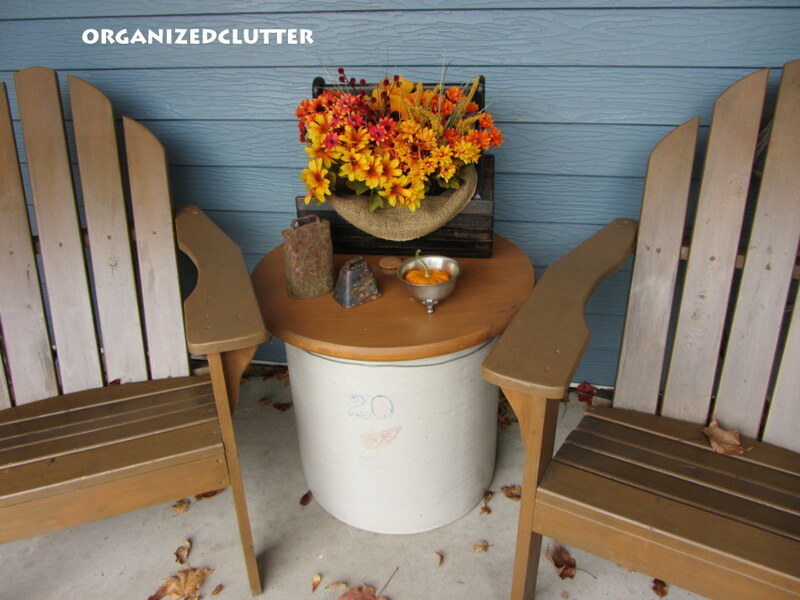 I've got the 20 gallon crock from my Baba that sits outside and holds a cascading flower in the summer. I like your smaller crock filled with those wonderful rolling pins! I'm embarrassed to say, I do not have a single piece of Redwing. Around here it is fairly easy to find McCoy, Shawnee and Hull because they were made in Eastern Ohio so I have a lot of those, but now I'll be on the lookout for some Redwing to add to my collection. I don't collect pottery....but I love the crock that was your grandmother's! What a beautiful tribute! I love the old crocks and have several on my porch. I love to fill them up at Christmas with rosemary. Very simple, smells great, lasts the whole months and looks perfect. It's great than you have one that was your grandmothers!! I suppose I'm deprived because I have no redwing pottery. I do truly appreciate yours though. Those crocks bring back fond memories and I'm nearly in love with the pink rooster! Good stuff and so fun to see it displayed.